Thanks for this post! It’s really interesting. I should mention that the testing setup (i.e. ~200k reads) is really close to the worst scenario possible for Salmon, as the online inference algorithm is really geared toward larger data sets. This means it probably takes a significant hit in terms of runtime (having to pass over the data *many* times) and perhaps, slightly in terms of accuracy. If you have a chance, would you mind showing the results in terms of TPM? Also, as you mention, Salmon (and Kallisto) are still under active development. We’ve made a potentially significant change to the way that the number of mapping reads is estimated (they were likely being somewhat underestimated previous) — I’d be very curious if the latest version of Salmon (https://github.com/COMBINE-lab/salmon/releases) performs any differently. Anyway, these are minor points; thanks for the very cool blog post. We’re working hard on the Salmon manuscript and hope to have a pre-print out relatively soon. Thanks a ton, Simon! I will definitely take a look at this as soon as I get a chance. The Salmon-only repo is a new development, as it allows us to slowly strip away the parts of the Sailfish codebase that are not required for Salmon. This, in turn, allows us to update the codebase and add new features more rapidly (Kallisto, actually, has inspired some new features that are currently in the queue). 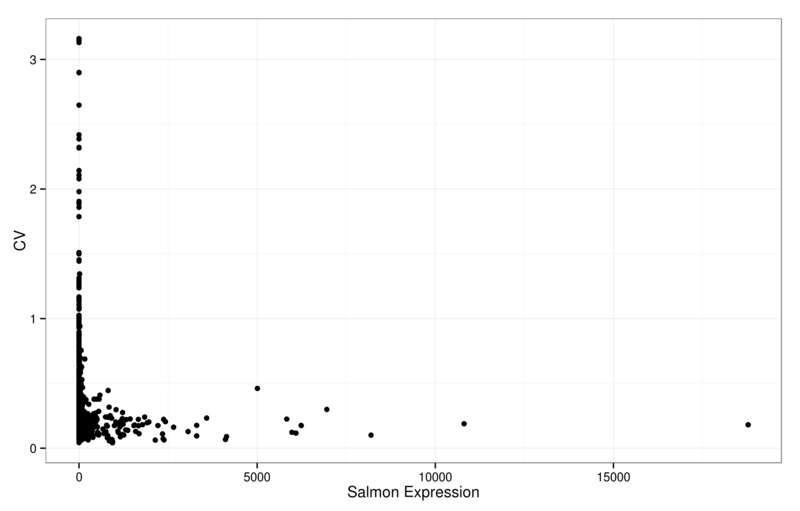 It also makes it easier to point people at just Salmon, which we will be doing with the pre-print (shortly, I hope). 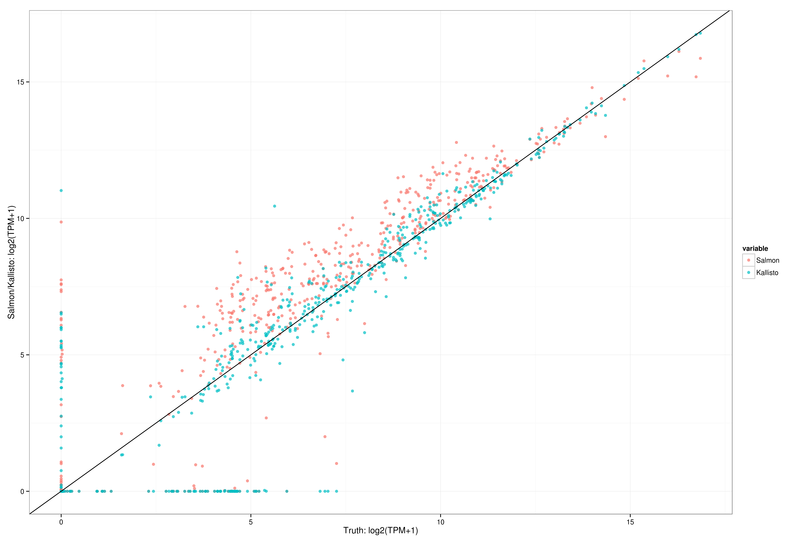 One more quick thought (after looking at the scripts & data), would you mind also including the **non** bias-corrected Salmon results in the plots (I’ll also be looking at this myself)? Thanks again! I’m also doing some comparison on my end from single-end data and I observe huge differences between eXpress and Kallisto. Do you expect to observe that same “almost perfect” correlation with Kallisto on single-end data ? Looking at the final plot (the TPMs), it seems that Kallisto has some false negatives that aren’t quite being accounted for in the correlations. Thanks to Simon’s awesomeness (i.e. putting the scripts required to reproduce his tests up on GitHub), I’ve reproduced these results accounting for these false negatives. The relevant IPython notebook (I’m horrible at R) is here (http://nbviewer.ipython.org/gist/anonymous/c0e1643f10f9b4d7a0a9). – I don’t think it’s fair to compare the variability in the bootstraps from kallisto to the variability in salmon. They are inherently quite different. 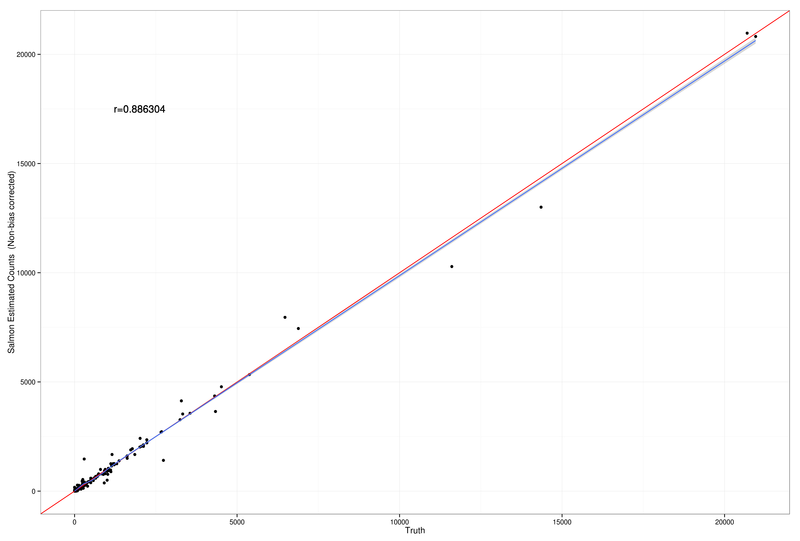 The variability in bootstraps from kallisto is measuring the variability you would expect assuming that you are taking several draws from the same population (and estimating them using kallisto). It is important to remember that the kallisto algorithm (currently) is 100% deterministic and the standard abundances (non-bootstrap) will always be the same. The differences you are seeing in Salmon are a bit different. It seems the Salmon algorithm is non-deterministic and you are getting different results when quantifying the same data. Thanks for your extra re-analysis. The analysis capabilities of sleuth look quite nice, and I’m looking forward to the package. I was wondering if you might elaborate a bit more on the “filtering” issue. I should mention that in the Python analysis, the filtering is much more of a data-specific “truncation” than a filtering to a sub-set of the data. By this I mean that my `filterExpression` function does not remove any data points from the dataset. Rather, it simply sets values less than a specified threshold to 0 (leaving the corresponding “row” in the data frame). Further, the value is only truncated to 0 in the cell in question (e.g. estimated number of reads), the other columns (e.g. true number of reads) retain their original values. This ensures that the total number data points remain the same in the different comparisons. Because, the python code doesn’t remove any data points from comparison but, rather, simply truncates small values, I believe that applying the same truncation value in both the true and estimated expression is the correct thing to do. The motivation for this is that we are, essentially, defining a minimum expression value that “matters”. However, since we are not removing any data points from the analysis, truncating the true expression values and the estimated expression values are independent operations. The filtering in the true data essentially says that transcripts with a true expression less than a specific threshold don’t have meaningful expression — likewise with the estimated expression. It seems that it makes sense to apply such a truncation symmetrically. 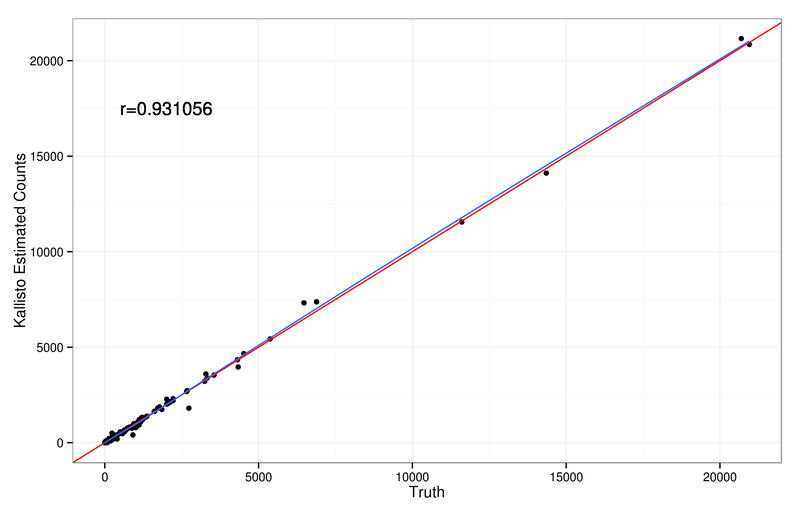 Of course, when filtering by removing data points, the argument is very different, since removing transcripts with low estimated expression may discard from consideration those transcripts with a low estimated but high true expression (and vice versa), which, clearly, one would not want to do. P.S. I really wish that the blog comments had an edit capability (like Reddit comments or Gitter chats)! The other thing that I noticed when looking at the data is that there are a few hundred transcripts that were quantified (part of select_transcripts.fa) but which don’t have an entry in the ground truth (oracle) data. 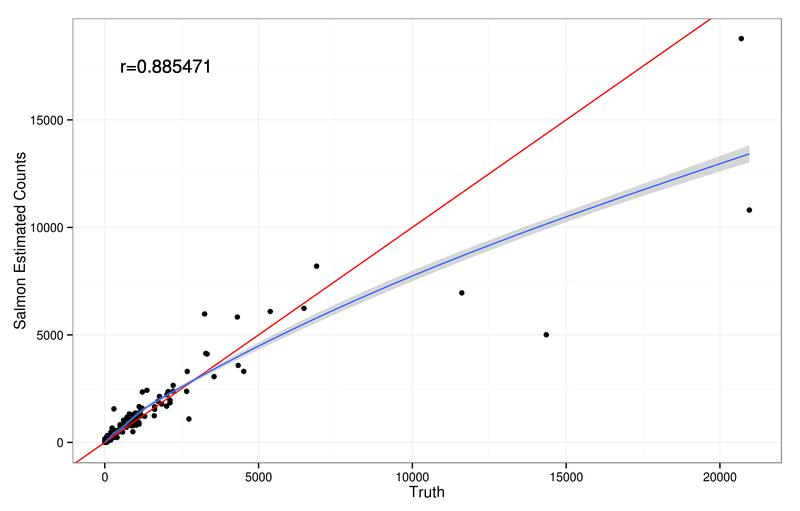 I believe that these transcripts should be included in any analysis, since the tools (Kallisto and Salmon) *did* consider them when estimating relative abundances (this means we’re performing analysis on all 1,129 transcripts rather than the 913 that appear in the intersection of the ground truth file and the estimated expressions). Also, I’ll make attempt to port your other analyses into Python to keep the two at parity. Rather than averaging all of the Salmon runs, I will pick a single run — this seems a better representation since, as you mention, there is a stochastic element to salmon’s optimization and the optimization algorithm works “within sample”. Further, there is a lower bound on “cancelling” errors between runs since 0 is a lower bound on e.g. TPM and estimated number of reads. Currently, I’m getting somewhat different results in the Python analysis of e.g. median relative error where both method seem to have a median relative error of 0.0. I’ll report back here when I can figure out what might be causing these differences. Okay, I’ve updated the previous notebook (available to view here — http://nbviewer.ipython.org/gist/rob-p/4e1285ac94456a46e3ce) with an analysis of relative difference. Indeed, in the Python analysis, I get a median relative difference of 0.0 using both methods (and the histogram of relative differences look very similar). Though there are likely some other things going on, it looks like the biggest component of the difference may come from truncating tiny estimated expression values to 0. I have a small analysis of the effect of this on non-zero median relative difference in my notebook. 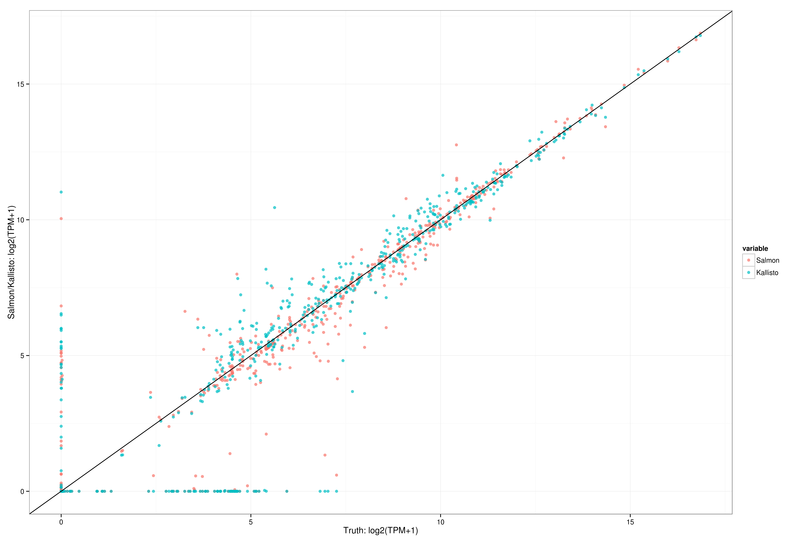 Essentially, the relative difference for salmon was being driven up by transcripts with a tiny predicted TPM where the true TPM is 0 (all of which get a relative difference of 2.0 — the largest possible — the way it is being calculated). For example, this non-zero median relative difference drops by an order of magnitude if we simply say that any predicted TPM < 1e-30 should be 0. I would argue that applying this truncation of values (again, this is not a subset-filtering — all transcripts remain in the comparison) is the fairest way of comparing across different methods. Specifically, I think it makes sense since some methods (in this case, Kallisto) apply a truncation internally — e.g. https://github.com/pachterlab/kallisto/blob/9e2cbaf558adf074b573ef346cc17a212b82197c/src/EMAlgorithm.h#L167 — while others (in this case, Salmon) do not.